Ten years ago, Hadleigh Stevens was eighteen and this close to saying "I do," when Tripp Galloway interrupted her walk down the aisle. Now that she's recovered from her youthful mistake and Tripp's interference, Hadleigh and her single friends form a marriage pact. She doesn't expect Tripp to meddle with her new plan to find Mr. Right—or to discover that she's more attracted to him than ever! Divorced and eager to reconnect with his cowboy roots, Tripp returns to Bliss County to save his ailing father's ranch. He's not looking for another wife—certainly not his best friend's little sister. But he's never been able to forget Hadleigh. And this time, if she ends up in his arms, he won't be walking away! 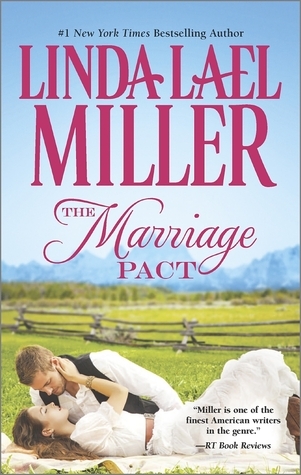 The Marriage Pact is the first book in a series by Linda Lael Miller - The Women of Bliss Country. Hadleigh and her two friends Bex and Melody decide to support each other in finding the right marriage partner and wedded bliss. They even have identical charm bracelets, and when one of them marries a charm just suited to the one getting married will be added to all the bracelets. Hadleigh has already made an attempt to be married - rather injudiciously, and was embarrassed by her brother's friend, Tripp. His intervention went unappreciated, and Hadleigh's plea to go with him to L.A. was turned down. She runs a quilt shop - this is an aspect of the book that I wish had been integrated a little more into the story in some way. We only fleetingly see Hadleigh in her shop. Tripp is now wealthy in his own right, has sold up his business and returned home to Mustang Creek to help out on the ranch. His dad has been ill; the ranch is somewhat run down. Tripp is ready to stay and make something of the ranch. He has been out into the world and experienced all he wanted, and after one failed marriage he is ready to settle down. I really liked the relationship between Tripp and his step dad - Jim. Tripp is very caring and considerate, and Jim has always considered Tripp as his own son. Tripp's mother and Jim's wife had died a number of years before. Now Jim is ready to live life a little differently. I totally enjoyed his new venture - some might say a little rushed, but I think when you get to a certain age you are ready sometimes to take big and most times rewarding leaps. Linda Lael Miller's books often include animals that fit really well into the story. Again I loved Tripp's dog Riddley and the dog Muggles that Hadleigh rescues when a neighbor falls ill. As well there are the horses that Tripp adds to the ranch. The book alternates between Hadleigh's and Tripp's point of view. That works really well and the details about there growing up in the same town, with a person in common to both to link them from when they were young - Hadleigh's brother (killed in Aghanistan) who was also Tripp's best friend. I liked the book, it mostly relied on the characters to develop and move the plot along. I found that there was not a lot of tension in the story, however if you enjoy a pleasant story with warm relationships then this story could be for you. I always enjoy Linda's books, and look forward to this book. She does write a good story.